Let me introduce you to something stupid. It’s a press release (or at least that’s what Jerry Collette called it) posted on Sam Sewell’s blog, The Steady Drip. 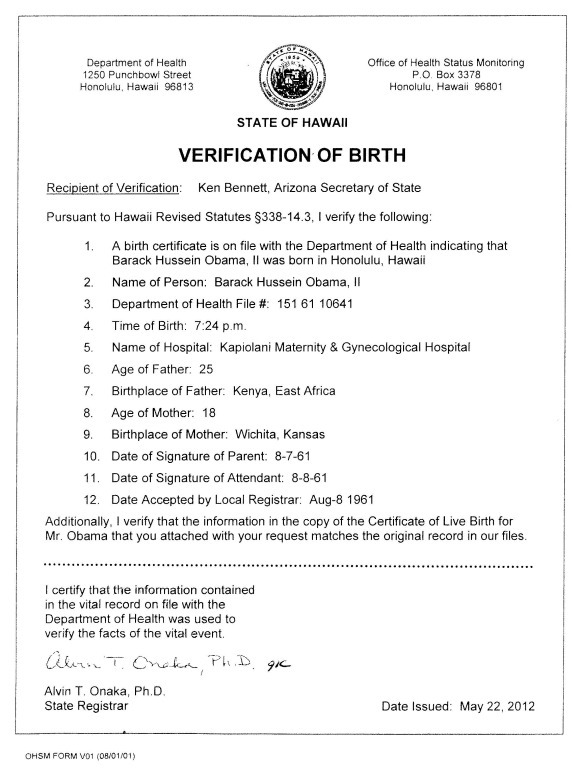 If I survive the motions to dismiss, Obama would permit me access to the original and microfiche birth records in Hawaii and the copies he claims to have gotten from Hawaii last year, then I would waive all other discovery. This is stupid on several levels. 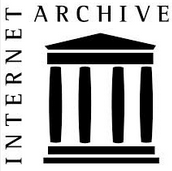 First President Obama has no authority to release original archival records and microfilm held by the Hawaii Department of Health. He can’t release them and no court in Florida could enforce a subpoena to obtain them. So if Obama cannot hold up his side of such an agreement, he couldn’t make the deal. Collette must know this, and so the offer is disingenuous. Implicit in the “offer” is a promise by Collette not to seek Obama’s social security, draft, and college records. What possible advantage would there be for Obama to limit such discovery? The draft records were released under FOIA in 2008. The social security and college conspiracy theories never had a grain of reasonableness behind them. Further, social security, draft and college records have no relevance to presidential eligibility, and Collette couldn’t obtain discovery of them anyway. So the offer to limit discovery for items not accessible under discovery in the first place is also disingenuous. 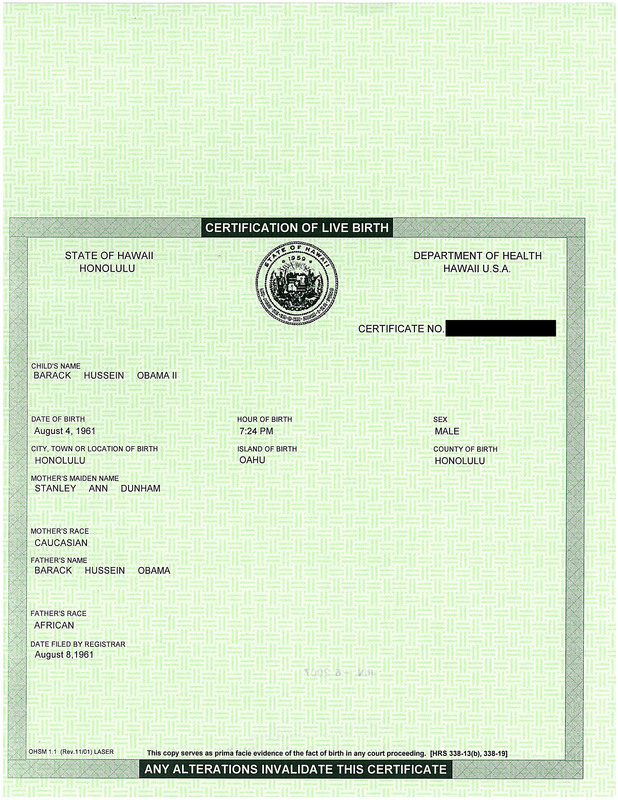 Finally, if Obama took the deal, the birthers would immediately say that Obama caved because there is obviously something terrible in those other records, and if he doesn’t take the deal, they will say that he’s desperate to hide the birth certificate. 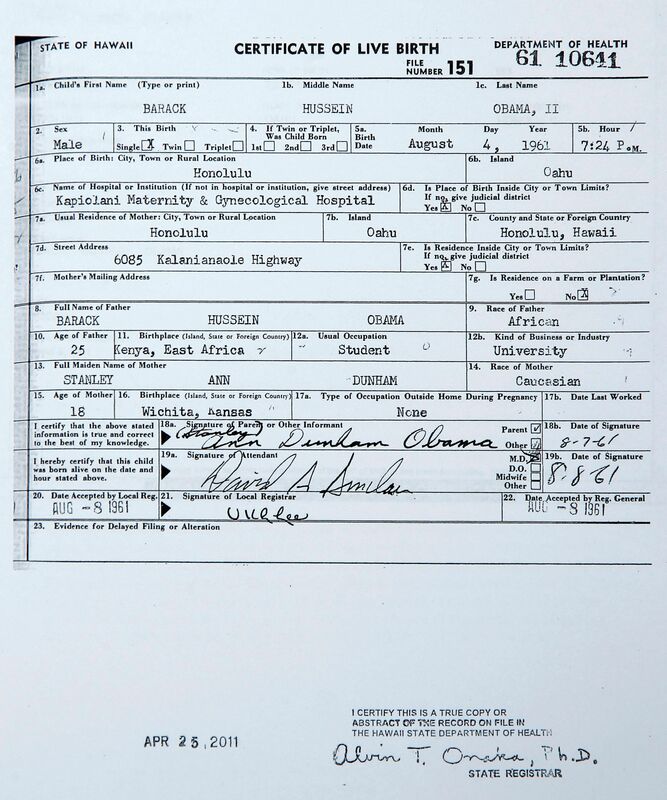 Specifically, what the birthers believe has no relation to what Obama does or doesn’t do. They will say whatever bad things suit their fancy. The title of Sewell’s article is: “Florida Paralegal Checkmates Obama’s Lawyers.” That’s funny because Obama’s not playing. The Court will dismiss the lawsuit and that will be the end of it. Now which is more stupid? Obama’s attorney if he took the deal? Jerry Collette for thinking in his wildest imagination that Obama’s attorney would take the deal? Birthers who read The Steady Drip and believe that the offer is sincere? I’m going to be away from the Internet for a week starting Saturday. This article is where you may discuss the progress of Voeltz v. Obama in Florida. There was a hearing in Florida this morning in the case and Judge Lewis has previously stated that he intends to render a decision expeditiously. Since there will unquestionably be an appeal of the Judge’s ruling, I think the teleconference hearing today is a chance for all sides to get their arguments into the record for that appeal (appeals cannot introduce new arguments or claims). WorldNetDaily made a huge publicity splash for the last hearing including a live video feed, but has not even mentioned the one today. That’s not really a surprise since it’s almost certain to be dismissed. No news from the hearing yet. Note that all of the documents from this case are available on the Court’s “High Profile Cases” page. Based on comments at the Obama Ballot Challenge site, it appears that Judge Lewis has struck the “Second Amended Complaint”. I can’t say that I have ever heard of anyone before suggesting the indictment of a Supreme Court justice (let alone two) for judicial misconduct. I grew up in the South with “Impeach Earl Warren” billboards on US Highway 45 (at least in those days people knew a little about the Constitution), but no one ever suggested indicting him. Ironically, the Court has previously held that the grand jury belongs to the people, and not the other three branches of government. Following established grand jury procedures, I will empanel a grand jury in Florida and seek the indictment of Chief Justice Roberts and Kagan. The Framers of our Constitution created the Citizens Grand Jury for the people as found in the 5th Amendment. By so doing, they created a legal mechanism to hold corrupt judges and politicians accountable under our criminal laws, thereby hoping to avoid another revolution as occurred in 1776. And I thought he was crazy to try decertify a Florida election that wasn’t held. This is a whole new level of crazy. Hmmm, maybe we Obots should get our own people’s grand jury. I’ve got a little list. 2”Mob” is often a misnomer because many lynchings were well-organized and premeditated. This is why I think a people’s grand jury is aptly compared to a lynch mob (without the enforcement capability). The Leon County court docket shows a hearing scheduled for 9:00 tomorrow morning (June 29, 2012) before Judge Lewis in the case of Voeltz v. Obama. I had hoped for a decision this week, but I presume the filing of a “Second amended complaint” by Voeltz’ attorney Larry Klayman and two other filings (a motion to strike the “unauthorized” SAC and a motion in opposition) have led to this second hearing. The fact of the second hearing suggests to me that Judge Lewis is going to allow the “Second amended complaint” and the hearing is to discuss new points raised in that complaint, specifically the plea for declaratory judgment. Also noted on the docket is the notation: “High profile case” and the filing of an amicus brief filed by Scott Rille1. Based on Judge Lewis’ remarks to Klayman at the last hearing about including material for an appeal, I concluded that he was prepared to dismiss the case: Klayman wouldn’t appeal a favorable decision. 1Scott Rille is a name not familiar to me. There is a note at The Fogbow linking to an online dating service for men looking for Russian brides and a Scott Rille profile. The occasional open thread: open hearts and open hands edition. Place your Obama Conspiracy items not related to the current articles here. The thread will close in two weeks. Political spending is in the news this week, both because of the Supreme Court decision yesterday, and news items about Super PACs for Mitt Romney raising hugely more money that Super PACs for Barack Obama. I heard clips from both Obama and Romney whining about the other side raising more money. Whatever side of the fence you’re on, I think that we’ll agree that money is important in getting the message out. The only solid number I have for birther spending is the $40,000 of tax-exempt money going to fund the Maricopa County’s Cold Case Posse publicity campaign and a $320 filing fee I think I saw attached to a birther federal lawsuit once. Add to that WorldNetDaily promotion and funding and half a hundred or more web sites some with professional web design. Orly rents the National Press Club and travels all over the country. 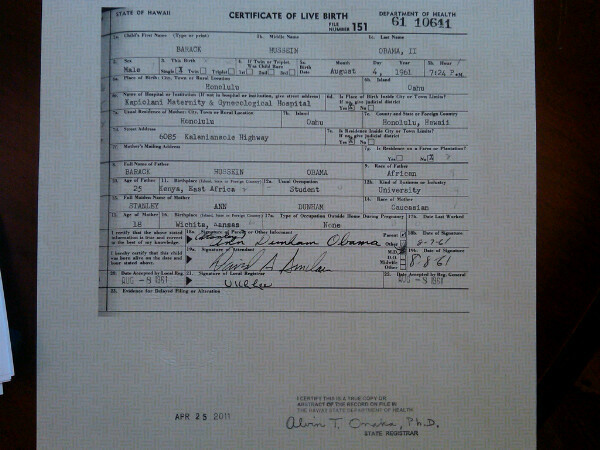 I wouldn’t be surprised if the birther expenditure in total hit half a million. The Obots, a wholly self-funded endeavor, aren’t in that ballpark. Probably the biggest expense by far among anti-birthers is the money it takes to download all of those court documents. Just figure 10 cents a page (max of 30 pages per document charges) times the number of pages in the Jack Ryan Scribd collection for federal cases. I don’t know what state court costs are and transcripts. Second to that are perhaps travel expenses to report in birther court hearings. Then there’s premium web hosting like mine which runs $20 a month now with $70 one time for the premium WordPress theme. The Fogbow might be more than that. My back of the envelope calculations say birthers are out-spending the Obots over 10 to 1. Fortunately, we get lots of free publicity from the press and the courts. If anyone would crunch the speculative numbers differently, jump in.